Dec 7 (Sat): Flew back to Penang from KL. 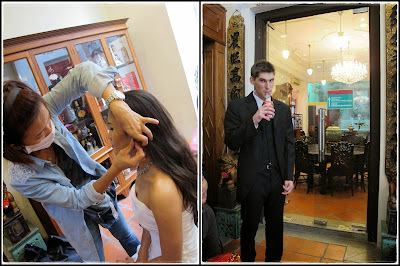 Dec 8 (Sun): Daniel's suit fitting for the photo shoot. Dec 10 (Tues): Pre-wedding photo shoot at the studio, Peranakan Museum & Blue Mansion. Dec 11 (Wed): Went to various government offices for marriage registration procedures. Dec 12 (Thurs): Met up with the band to discuss about the wedding dinner itinerary. Dec 13 (Fri): Pre-wedding photo shoot part 2 at Bukit Panchor State Park & photo selection for wedding album. 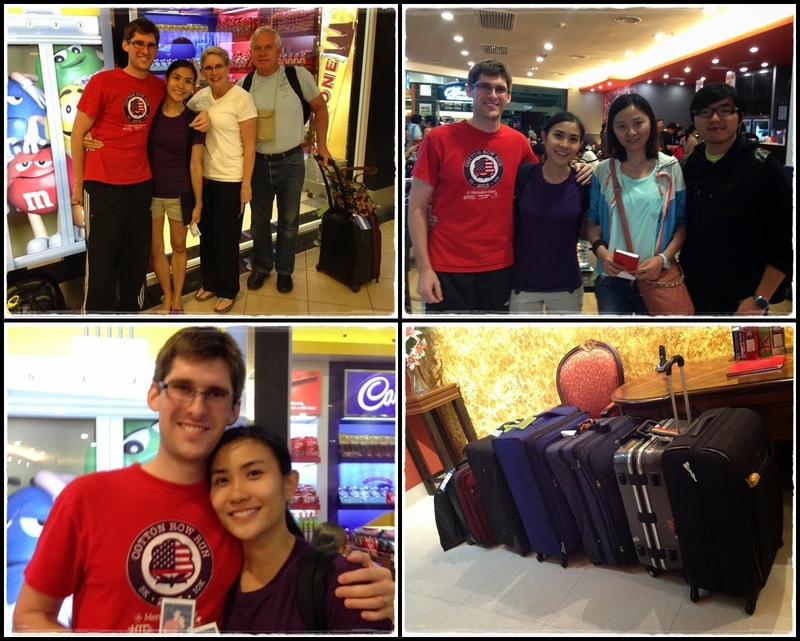 Dec 19 (Thurs): Daniel's family (Donny, Donna & Anna) arrived from the US. 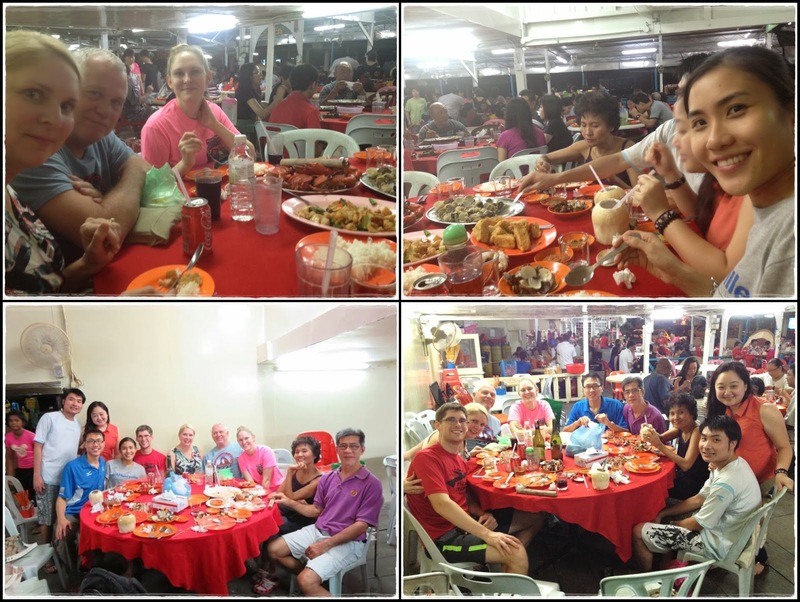 Dec 20 (Fri): Lunch with our families at Nandos and had seafood dinner at Tambun. 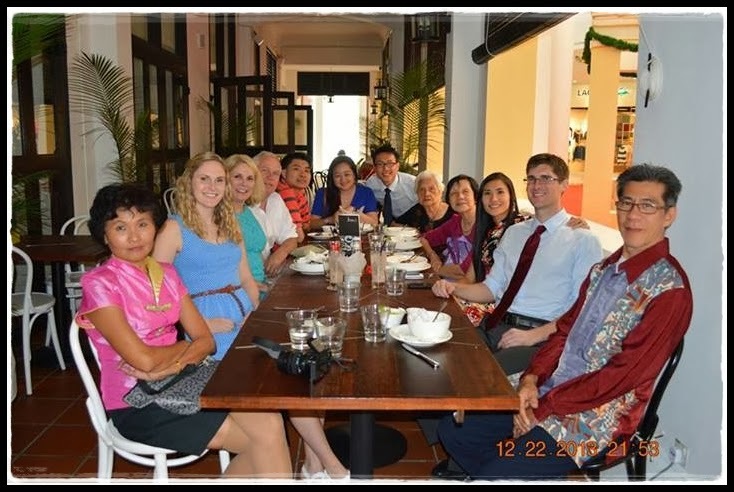 Dec 21 (Sat): His family checked-in to The Cove condo at Tanjung Bungah. 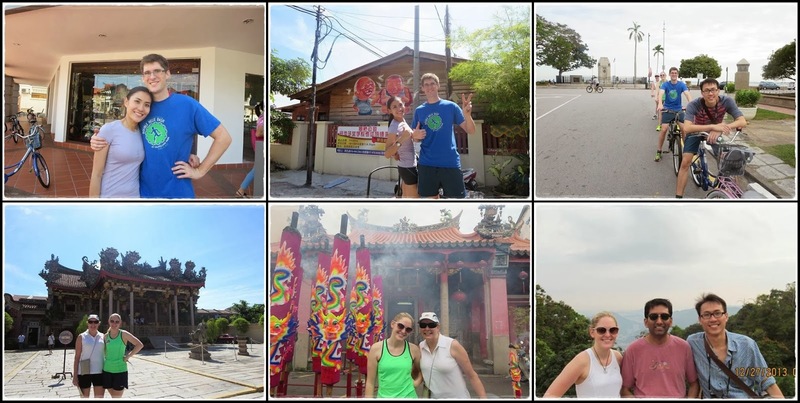 Dec 22 (Sun): Cycling tour around Georgetown with Donna, Anna, big bro, SIL & bro. Dec 23 (Mon): Marriage registration ceremony at the National Registration Dept office. 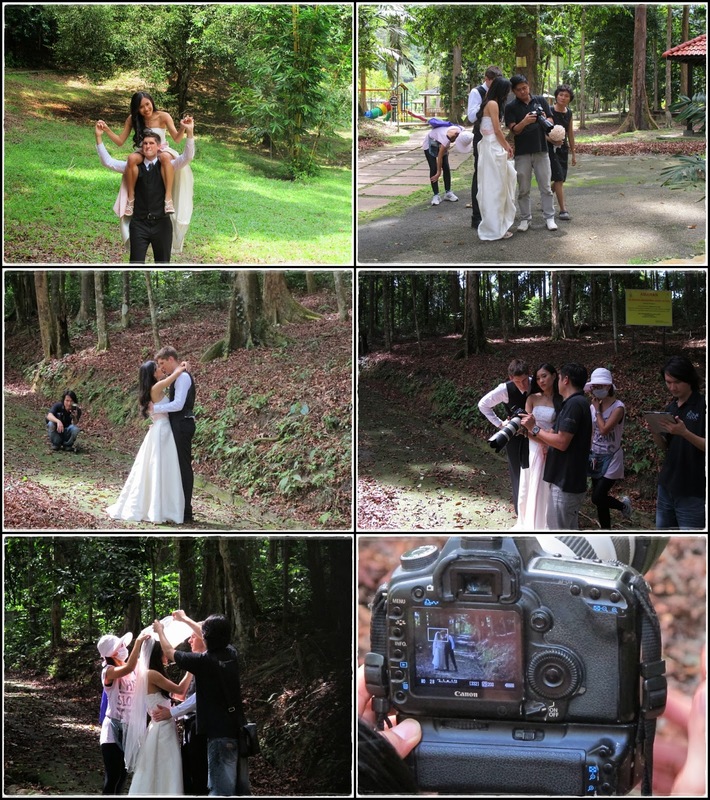 Dec 24 (Tues): Final round of spring cleaning at Tambun to prepare for the wedding. Dec 26 (Thurs): Kedar (his best man) arrived from Bombay. Sheng brought 'em around Pg. Dec 27 (Fri): Test run wedding slideshow at the restaurant, attached wedding car ribbon and collected our gowns and suits from the bridal house. Dec 28 (Sat): The BIG day. I'll save this for another post. 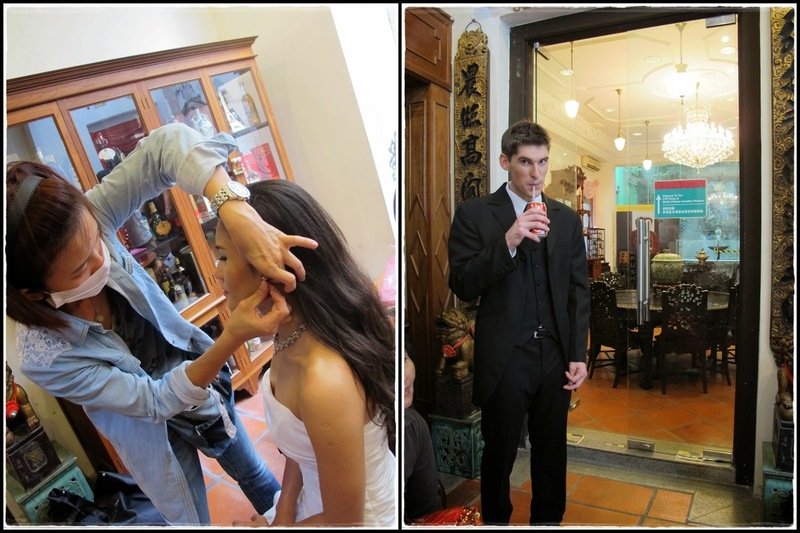 Dec 29 (Sun): Brought Lou and DingDing (who flew all the way from Shanghai to attend our wedding) for sightseeing around Penang. Dec 30 (Mon): Time to say goodbye to him and his family. 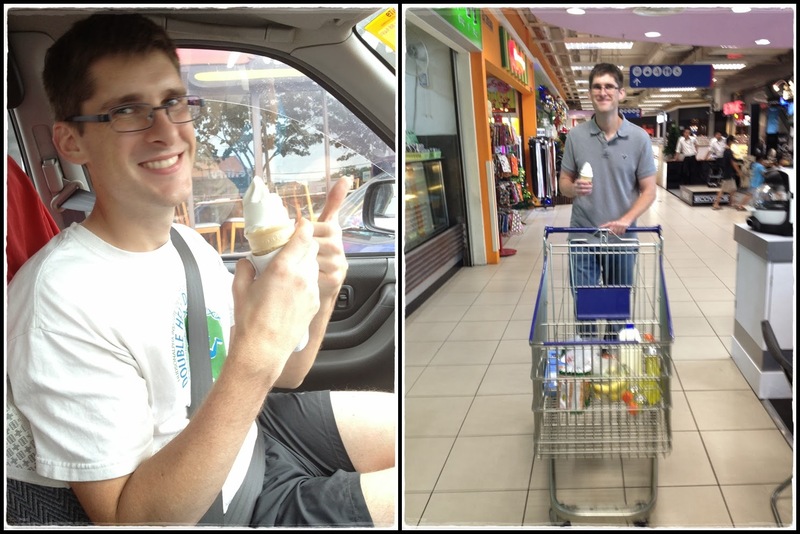 Groceries shopping may be ordinary but we only get to do it together once a year. Crazy boy trying to look cool in these female sunglasses...lol!! Arrival of his family. 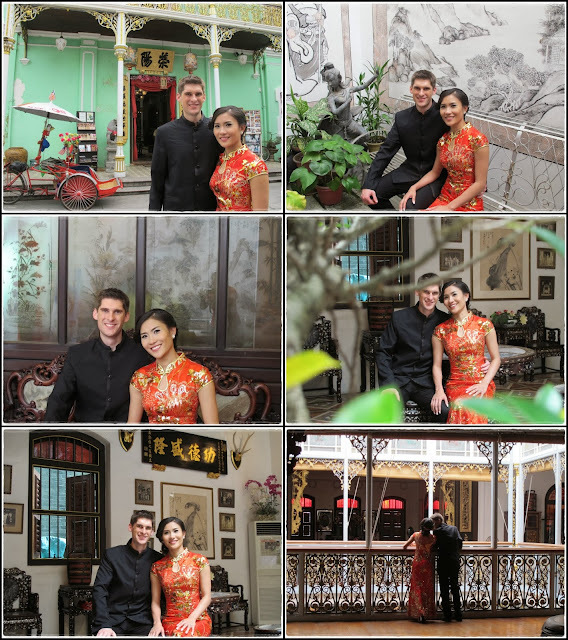 Donny and Anna's first trip to Asia. Seafood galore at Tambun. Bro brilliantly ordered octopus to give them some 'exotic' experience. 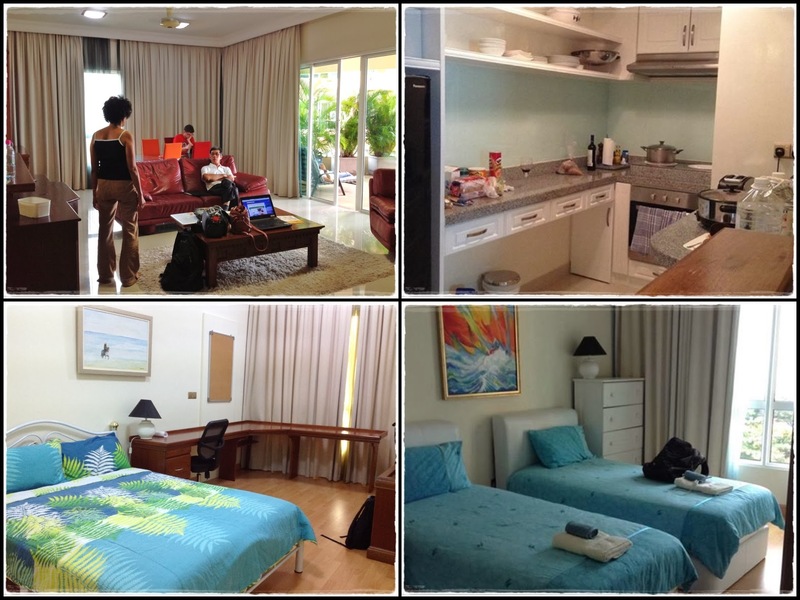 They rented this condo at The Cove...'atas' place by the beach with good facilities and a lot of expats. 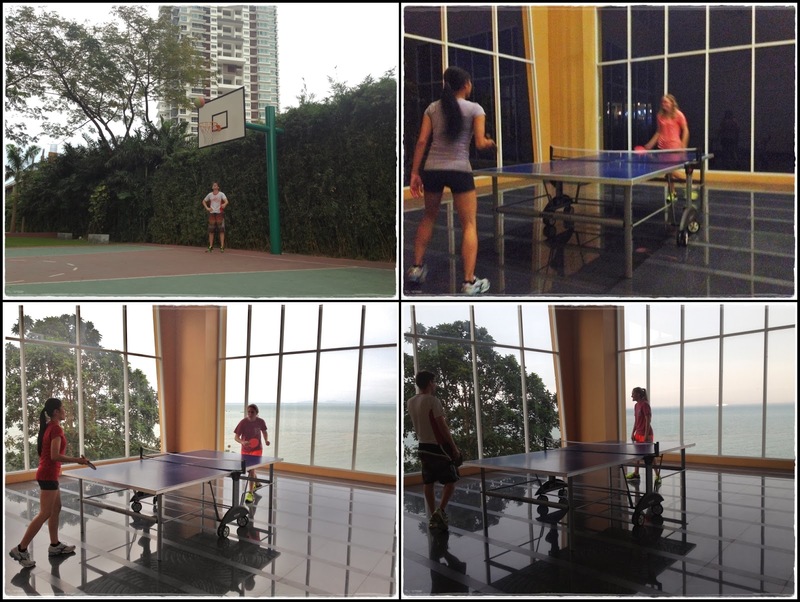 忙里偷闲...utilized the condo's facilities to sweat it out. They were very excited to try the 'Prosperity' burger...lol!! 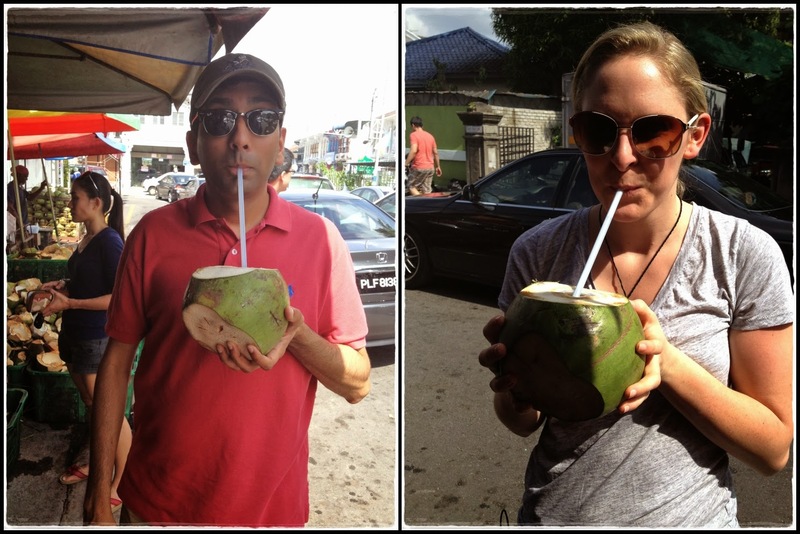 The tourists trying out the very 'fresh' coconut drink. 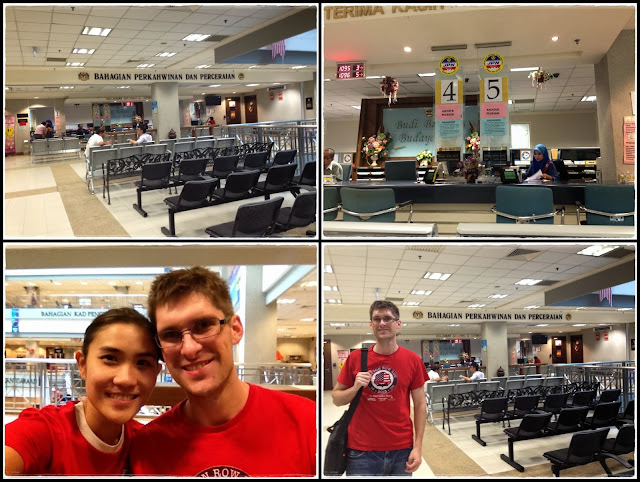 Time to say goodbye and back to LDR for again. =( Some people asked me where are we going for our honeymoon but unfortunately we had no time for it coz he had to fly back 2 days after the wedding and we both had to get back to work after taking off for one month. This was for Daniel (the foreigner). He asked about this document from the marriage license office in Huntsville but since he has never been married before, they had no records for him. He then emailed the US Embassy in KL to ask about this and was informed that he could get it at the embassy when he gets to Malaysia. 2. GET THE SINGLE STATUS DOCUMENT NOTARIZED BY THE EMBASSY. 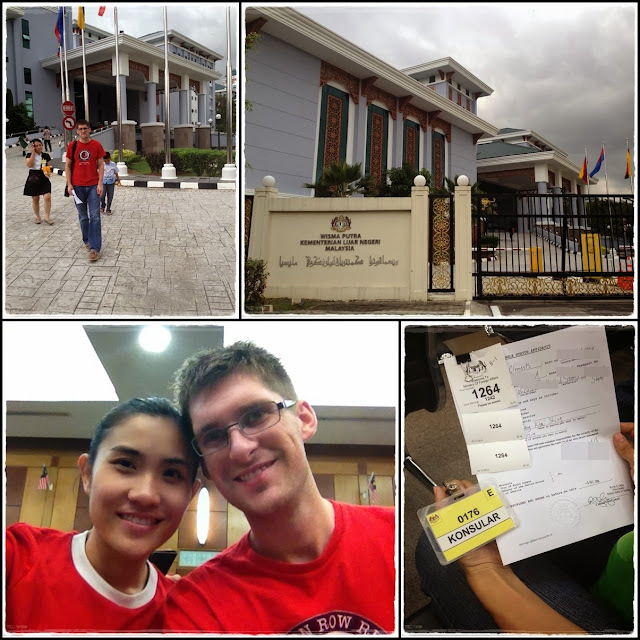 We went to US Embassy in KL and it was quick coz Americans didn't have wait in line. He filled up the 'Single Status Affidavit' form, had it notarized, and paid a fee of USD50. All done within an hour. We then headed straight to Putrajaya for the next procedures. 3. GO TO THE MINISTRY OF FOREIGN AFFAIRS IN PUTRAJAYA TO GET THE SINGLE STATUS AFFIDAVIT ENDORSED. We knew that the office was closed between 12pm-2pm so we got there around 2.30pm. We registered at the guardhouse with our ID (IC/passport etc.) and went to the counter to get the endorsement. We waited for about 1 hour before the document was endorsed and made the payment of RM20. 4. GO TO THE JABATAN PENDAFTARAN PERKAHWINAN (DEPARTMENT OF REGISTRATION OF MARRIAGE) AT THE 3RD FLOOR OF THE JABATAN PENDAFTARAN NEGARA (JPN) OFFICE AT PUTRAJAYA TO SUBMIT THE SINGLE STATUS AFFIDAVIT AND GET THE AUTHORIZATION LETTER TO BE SUBMITTED TO THE JPN OFFICE IN PENANG. We were lucky that there was nobody there so we did not need to wait at all. 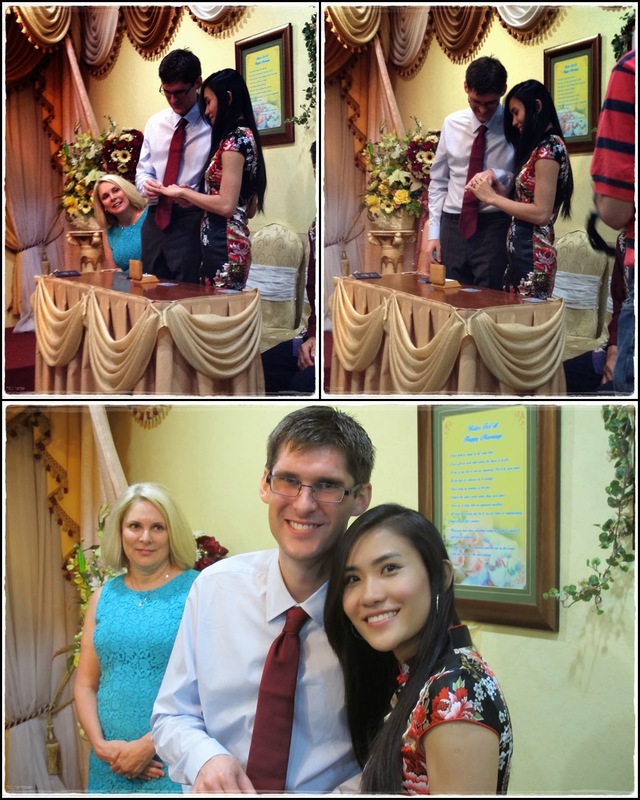 We filled up a form and submitted copies of Daniel's passport, birth certificate, my IC, and the Single Status Affidavit. They didn't ask us any questions and after checking through all our documents, they issued us with a letter enclosed in a sealed envelope which we will have to submit to the Penang JPN office. We were done with everything by 4.30pm. So that's it for all the procedures that we had to complete in KL. All these procedures just to get him authorized to get married in Malaysia. The actual marriage registration procedures will have to be completed in Penang. 5. HEADED TO PENANG JPN'S JABATAN PENDAFTARAN PERKAHWINAN. 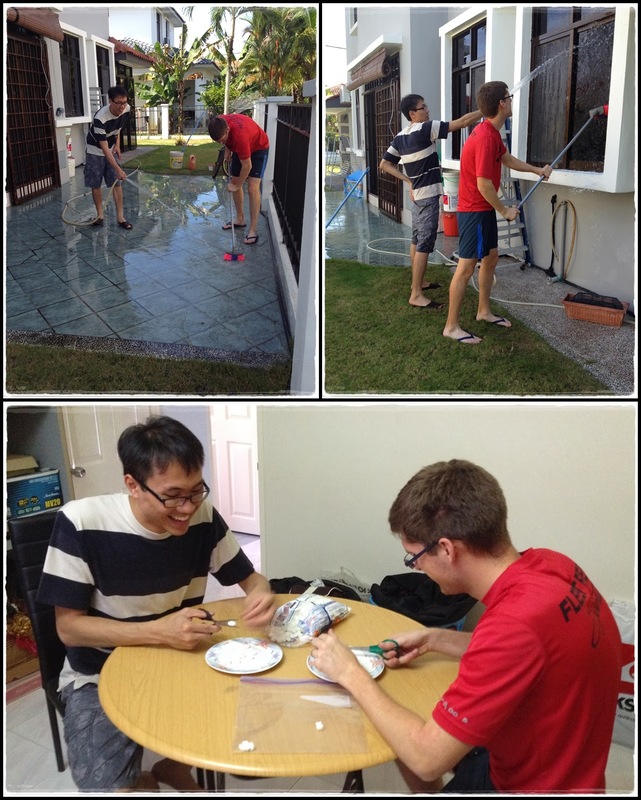 We couldn't start the application process in Penang until Daniel has resided in Malaysia for at least 7 days. He arrived on Monday and the soonest we could start the process was the next Tuesday. I've already gotten the marriage registration form in Putrajaya and filled up all our information before hand. We could have just gone straight to the High Court to take our oath but we weren't sure exactly what the procedure was so we went over to JPN first to find out what to do next. 6. WENT TO THE HIGH COURT TO TAKE OUR OATH. After the officer looked through our documents briefly, he told us that we had to go to the High Court to take our oath. I was trying to finish as many things as possible before the government offices close for lunch break so we were driving around town as if we were on the amazing race. =P We went to the counter, waited for our turn to make the payment of RM4 then went up to 2nd floor to see the translator. Basically the translator just 'translated' the content of the marriage registration form and ensured that Daniel understands that he's gonna sign a paper to get married in Malaysia. She then signed, dated, and stamped on the form. This was done in half an hour. The officer checked through the completed marriage registration form (with the translator's stamp), copies of all our documents and attached each of our passport size photos. As we needed an 'express service' coz Daniel was gonna fly back to US in less than 21 days, the JPN officer gave us an 'express service' form that we had to fill up. 8. WE WENT TO KOMTAR TO GET THE CHIEF MINISTER'S APPROVAL ON THE 'EXPRESS SERVICE'. We went to the 3rd floor of Komtar, asked one of the officers about the 'express service' for marriage and was directed to the payment counter. After paying the 'express fee' of RM100, we were told to go to the CM's office at 25th floor. The secretary came out to get our forms and told us that she would call me after the form is signed by the CM. I thought it could be done on the same day but she told us that it would only be done the next day. That means we were done for the day, another successful morning for us: 10.45am JPN - 11.15am High Court - 12pm JPN - 12.45pm Komtar - 1pm Done. Once again, I was impressed by our government offices' efficiency. 9. COLLECTED OUR FORMS FROM KOMTAR AND SUBMITTED TO THE JPN OFFICE TO GET THE DATES FOR THE REGISTRATION CEREMONY. We went back to Komtar on Dec 13 to collect our forms that has been signed by the CM and took the forms back to Penang's JPN. After checking all our documents again, we finally got to select the dates for our marriage registration ceremony. There are only 3 slots available per day between 9am-11am and the earliest date possible we could select was 23 Dec 2013 so we reserved our slot. 10. MARRIAGE REGISTRATION CEREMONY AT JPN. 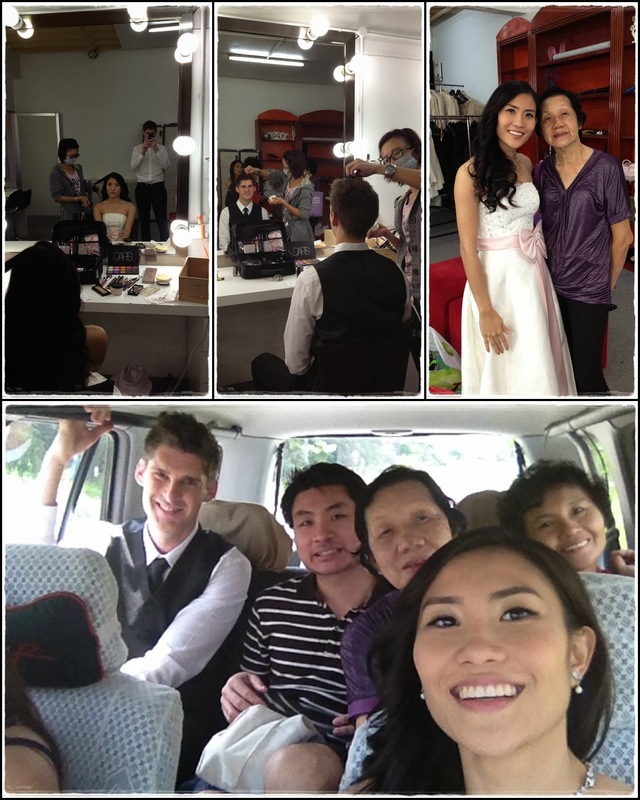 Both our families arrived JPN at 9.30am and waited for our turn for the solemnization ceremony. 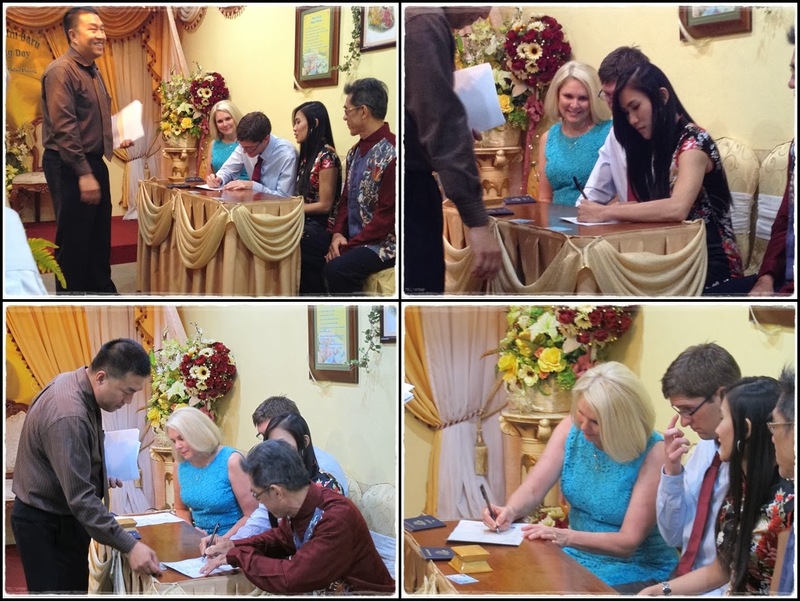 We paid RM20 for the marriage certificate and another RM10 for the endorsed copy for Daniel to bring back to the States. 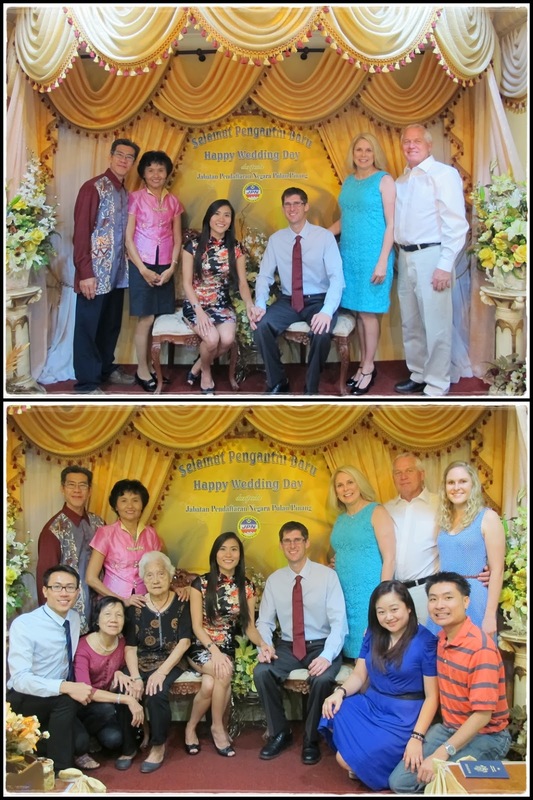 The entire ceremony took less than 20 minutes and all we had to say was 'YES', 'NO', and 'YES, I DO'...lol! !